Nowy sedan 1900 T.I. (Turismo Internationale) oferuje wieksza moc dzieki zastosowaniu dwoch gaznikow. Zastosowano wiekszy, 85 zamiast 53 litrowy zbiornik paliwa. Predkosc maksymalna okreslana jest na 170 km/h. Oferowany jako Coupé lub kabriolet 'C' 1900 Sprint ma rozstaw osi skrocony z 2630 do 2500mm. W odróżnieniu od sedana, który ma nadwozie samonośne, budowany jest na podwoziu ramowym. Wyścigowy prototyp Disco	Volante (Latający Spodek) powstał na bazie sportowego 1900 C.
Starting in 1952 the assembly lines become fully operational. 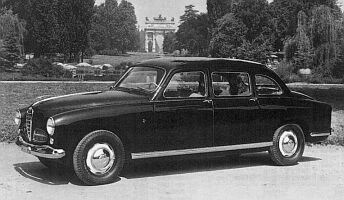 The normal 1900 was joined by the version TI (Turismo Internazionale). The motor (inherited from the "Sprint") is delivering 100 bhp at 5500 rpm/min thanks to a double carburetor. 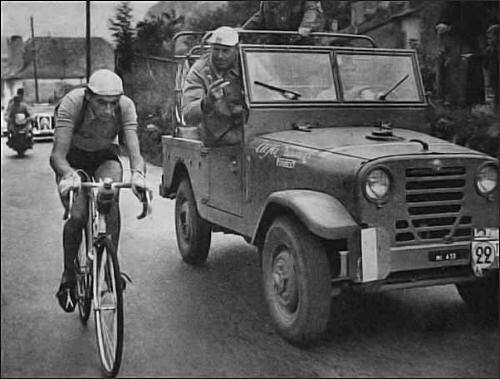 The braking had been improved with larger diameter drums. 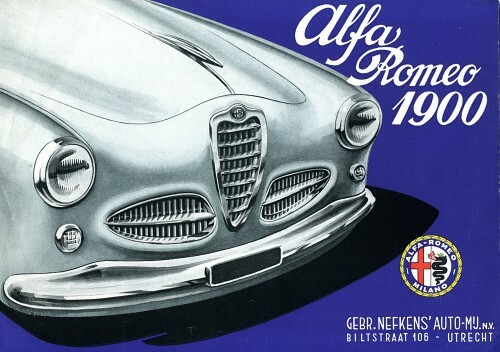 The selling slogan is: "The family car that wins races". 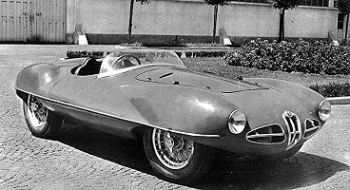 C 52 Disco Volante (Flying Saucer) was designed in collaboration with Carrozzeria Touring. It is based no the 1900 C.
6C 3000 Competizione Maggiorata has the body by Carrozzeria Colli of Milan, with some remembrances from the style introduced by 1900 Disco Volante. 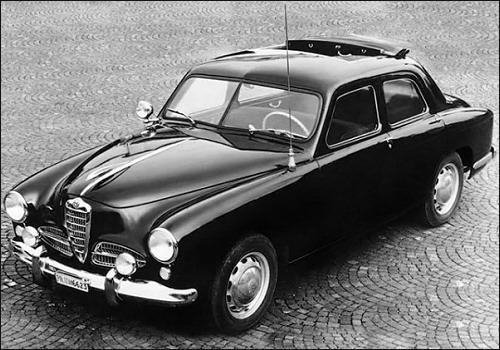 It use some components of the 3-litre 6-cylinder from the 6C 3000 prototype, but engine capacity was increased to 3495 cc. After several evolutions, it reached a power of 275 bhp (205 kW). Six cars were built: four coupé and two spiders. Przedłużona wersja 1900 budowana przez firmę Colli. 1900 TI Pantera built for the police special foces. It is equipped with armoured plates protecting the engine, two piece shatterproof windshield, sunroof which allow use of firearms and special protections of the front tires, both from the nails and from the bullets, by means of a series of metal chains placed in front of the front wheels. 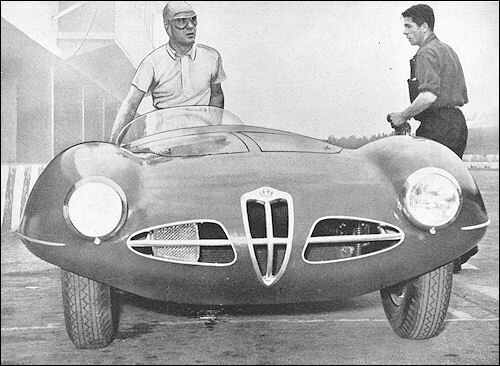 LURKING THREAT: In June, 1952, just before Le Mans, the Technical Editor of "The Motor" was given a preview of the sensational Alfa Romeo "Flying Saucer," which is an open two-seater sports-car powered with a four-cylinder 2-litre or six-cylinder 3-litre engine. Designed in close combination with Superleggera Touring, the body is structurally notable for being combined with the frame by tubes of varying diameter and externally revolutionary in that the transverse section is an ellipse with its axis slightly above hub level. 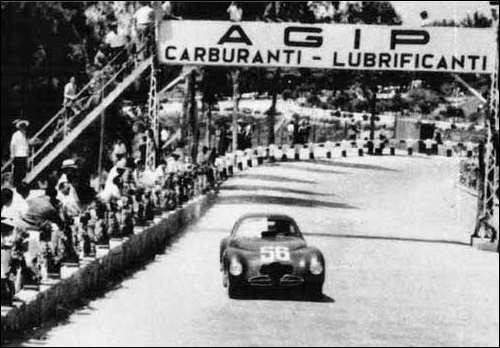 Although entered, these cars were not run in any 1952 sports-car race but will be formidable contenders in the forthcoming season. 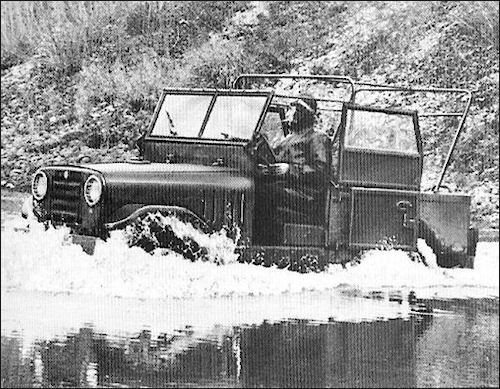 The Matta started it's life in January 1951 designed a replacemet for the Italian Army Willys Jeep. Ing. 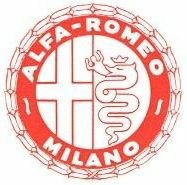 Giuseppi Bussi put an Alfa 1900 Berlina engine into a Jeep for the first mock up. The engine was taken straight out of the 1900 Berlina but later detuned for greater torque. Power dropped from 80bhp at 4,800rpm to 65bhp at 4,400rpm with a top speed of 105km/h (65mph). 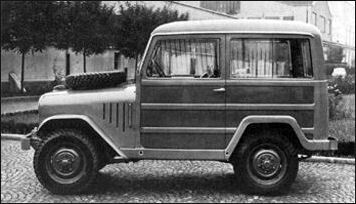 There were six prototypes made, one fitted with a diesel engine. Matta made it's debut in March 1952.